OK, I know Mammoth Bar is a OHV playground for gas-powered maniacs but that doesn’t mean it isn’t a great place to walk other-wise. It is currently open only for 3 days a week to motorcycles (Sun., Mon., Thurs.) during the summer (April-Sept.) so that leaves four noise-free days a week for the human powered rest of us. The river bar trail is really a nice way to enjoy the river, with easy walking and access to the numerous bars along the Middle Fork; Texas Bar, Browns Bar, Kennebeck Bar, and Hoosier Bar. Directions: From Auburn take highway 49 towards Placerville for 3 miles to the confluence. At the bridge stay straight and continue on Old Foresthill Road about 2 miles, watching for the entrance gate on the right. If the gates closed you can park outside the entrance in a pull out along the road. If you wish to save some walking and drive down to the river trail there is a day use fee. The trails go up and down the creek drainages connecting the river bar trail to the upper Stone wall trail. The connecting trails are mostly steep and rocky. 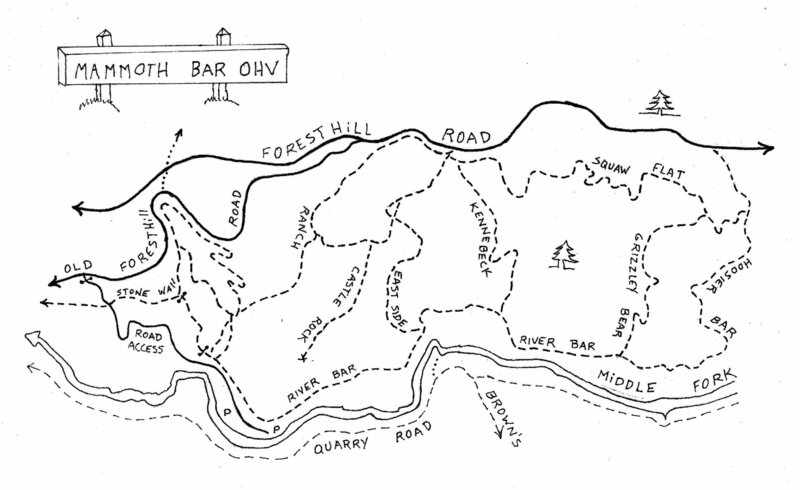 The river bar trail is an old road.